This kite was constructed from scrap dowel to specs very similar to the Dowel Roller. A slightly thicker spine was used. The soft Tyvek sail was made and decorated by a collaborator in Thailand who was helping me with some small-scale manufacturing for a while. And that was the expectation today, having seen an online weather report earlier. I thought there was a chance the Dowel Roller might fly, but by the time I pulled up at the reserve, the gusts were clearly too strong for it. Never mind, the more robust Red Roller was also ready to rig, as the backup kite. It's a good habit to have - bringing at least one backup kite so you're covered for a wider wind range. Very soon, after a short trudge to the southern side of the field, the Red Roller was rigged and surging about on a short line. Showing off for the camera, basically, in and out of turbulent air coming over the small trees upwind. Throwing a few loops off the winder, the kite was soon on 30m (100ft) of 50 pound line. The air was very active, causing the kite to drift down and then surge up suddenly as the wind strength varied. Just for fun, I shook the winder to allow the Roller to continuously pull line off. That it did, all the way from 30m to 60m (200ft) as the kite descended slowly and went downwind somewhat quicker! Gripping the line, the Tyvek-sailed Roller shot up in response and was soon soaring about at a steep angle. After some more video footage ws taken, I let the kite out to 90m (300ft) of line. Magnificent! The Roller really strutted it's stuff, getting powered overhead by rising air one minute then descending slowly with a bit of tail-wagging at other times. The red sail stood out well against the brilliant white of the cumulus cloud cover that occupied more than half the sky. A short but sweet flying session! Note: the Red Roller is basically an MBK Dowel Roller with a slightly thicker vertical spar plus a soft Tyvek sail. This kite is finally trimmed out perfectly it seems. After marking the vertical spar to indicate exactly which way to orientate it after doing up the ties and returning the altered sail tether to its original length, the kite performed amazingly today. This kite is a quick rig, even including the bow-string toggles... The line loops are a generous length which makes the toggles a little easier to insert. Down at the nearest reserve to us, quite a small one, the breeze was from the east and consequently quite rough. Nothing but hills and houses off in that direction, which really messes with the air. Puffs of breeze were coming across the sodden grass at regular intervals so it was easy to loft the big red Roller and get it hanging up there at about tree height, on 20 meters (60ft) of line. After a little camera-work, the line was let out to 60 meters (200ft) and the kite flew straight and true through every gust. Max gust strength seemed to be around 20 kph which would power the Tyvek and oak dowel Roller up to 60 or 65 degrees of line angle. Good! Despite the small size of the reserve, it seemed safe to eventually let out 90 meters (300 feet) of line. The Roller behaved impeccably, soaring around on a tight high-angled line, managing to stay aloft through all the lulls. At that height, the lulls were less extreme anyway. Nice flight, although the sun peeked out only briefly! Popped out once again with the 1m dowel-and-tyvek Red Roller kite. Also had the MBK Soft Sled as a backup in case the wind dropped. The last two days have been pretty wild, with lightning, hail and strong wind. Even snow in some of the towns out past the hills, which makes the news around here! The Tyvek and dowel Roller was rigged with a little more care this time. The vertical spar has to be rotated correctly before being fastened with the shoe-lace ties. Otherwise, a slight bow in the dowel tends to go left or right which throws the kite off trim! This penny dropped after I had shortened a sail tether to compensate for the turning problem the kite had on its initial outing some days ago. Today, I left the tether alone just to see if the kite went the other way. It did, a little, so I'll be returning that strap to it's original length! The breeze aloft was gusting well into the moderate range (mid 20s in kph) but the Roller just loved it, accelerating this way and that at quite steep line angles. 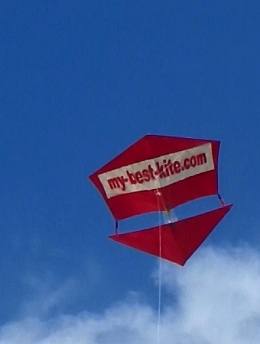 This kite has a considerably thicker and therefore heavier vertical spar than the MBK Dowel Roller, but in combination with the Tyvek sail material, the kite seems very efficient in moderate winds. Interesting! With the line finally out to around 45 meters (150 feet) the attractive Red kite put on a real show for anyone driving past. At times the Roller nearly over-flew, despite the cold air and minimal thermal activity. Hope no-one's getting sick of alliteration in the titles... Anyway :-), popped out with the 1m dowel-and-tyvek Roller to take advantage of a small break in the rainy weather. And as I type this, the roof is drumming with rain once again! Out at the field, the big Red Roller was quickly rigged and ready to go. A few short flights ensued, as light gusts came through which didn't prove enough to keep the kite aloft. Certainly not long enough to get any video shot. Somewhere to the east a kookaburra cackled. Time was not on our side, as dark clouds threatened to the south. Periods of sunshine were brief. But eventually, after a couple of small bridle knot adjustments, more line was let out and the kite proved stable and efficient at height. Even with the bridle adjustments, the Roller still had a tendency to sit to the right much of the time. That will be fixed later, by tightening one of the sail tether straps. A nice elegant way of trimming Roller kites. The difference in sail panel tension can hardly be noticed from the ground, but is very effective in correcting unbalanced flight. With the kite anchored to my bag on the wet grass, I scampered off to a nearby grassy mound to get some video without the sun causing problems. Around this time the kite was still descending to the grass now and again during lulls in the breeze. Each time, I would carefully drag the kite onto it's nose - followed by a flop towards me, a sideways rotation of the nose and then a firm pull into a climb-out off the ground. Less effort than walking all the way to the kite! Laziness? Nah - efficiency I call it ;-) Plus a small amount of fun-factor! Towards the end of the outing, five pelicans were spotted cruising in the distance, in V-formation. Finally, light rain began to fall and I hurriedly started bringing down the Red Roller kite. By this time it was flying at around 200 feet up at least, and was boosted high overhead by air being sucked up into the rain cloud. Tsk tsk, a bit naughty getting the line wet. No thunderstorms in the vicinity though. These were the first good high flights with the Red Roller. Next time should be even better with the sail tether adjusted. On arrival at the field, the gusts tumbling over the tree-tops were just into the Fresh range - over 28kph. This was a challenge for the Tyvek Roller, which strained first one way and then the other as I tried to fine-tune the bridle knot to trim the kite dead-straight. Despite the 2 bridle legs on the upper horizontal spar, the bow-line slackened off once or twice, as sharp-edged gusts forced more curvature into the dowel. Fortunately, there was no breakage, and some high-flying fun was had in the cool air and sunshine. Eventually a combination of extreme air pressure and a heavy nose-contact with the grassy ground did some damage to the central straps connecting the upper and lower sails. The Roller had to be retired for later repairs - a general beefing-up of those straps and their attachment to the Tyvek. So, out came the new MBK Parafoil kite, sporting a new bridle configuration. By now the average wind speed had died down somewhat. The kite had a better attempt at flying tail-less than ever before - but it was not to be. On went the drogue and up went the kite, on a 100 pound line. At least the kite flew noticeably smoother than ever before, with far less wagging from side to side. A tweak to the towing point was tried, by adjusting 3 sliding knots on the new 6-leg bridle. This shifted the towing point even further forward and made the flying smoother than ever. Unfortunately, this also made the kite more prone to doing a barrel-roll onto it's back from time to time! It was forecast to be a rather warm day but turned out to be outright hot instead - 37o C! Still, that's better than 43o which is a possibility in coming months. We had arrived at a beach location to fly with friends and a couple of kites were already up when we arrived. A light-wind Delta and a small single-line parafoil with flat ribbon tail were already holding steady in the gentle (12 - 19kph) breeze from the south. The first of our kites to go up was red Roller - after some on-the-spot repairs! The central ties of the main Tyvek sail had failed on a previous flight and I hadn't got around to fixing it. A few carefully placed strips of clear packing tape soon had the Roller airworthy again. As a bonus, the added tape proved almost invisible from the ground. The kite rose and descended over the next hour or so, in response to small changes in the breeze strength. At one point, the wind meter registered an average of 13kph gusting to around 15.5kph. None of us were flying on particularly long lines, since we weren't actually flying over the sand. Instead, a small grassy reserve was providing a reasonable area to fly since it lined up with the wind's direction. After taking down the Roller, I pulled out the MBK Parachute, which was launched fairly easily in the smooth breeze. Smooth, and just strong enough to hold the kite at a 30 degree line angle. I'm hoping the final prototype will hold steeper angles! Internal vents should pump up the outer sections of the canopy to a better shape. Finally, in a dying breeze, I played around a bit with the huge Multi-Dowel delta, working the line to get a bit more height. The kite's hugeness was verified by a few comments from small children!